BNS has signed a five-year exclusive contract with Max Media to build and deploy community-based IPTV services. The contract will see BNS supply complete IPTV turnkey solutions including network, equipment, software, content, and system integration, maintenance and support services in residential complexes including high-end estates, commercial buildings, service apartments and hotels in Taiwan. 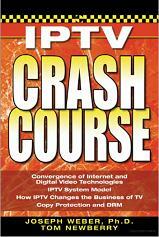 IPTV Crash Course offers an accessible overview of this rapidly evolving technology that is radically impacting the landscape of television distribution and broadcasting services. This practical resource offers straightforward, easy-to-follow explanations of the fundamentals of digital television as well as basic and advanced IPTV technology. You'll also find in-depth coverage of IP network client devices including hardware and software, allowing for an enriched entertainment experience. To order your copy and to review other books, go to our IPTV Books page. Groteck Business Media gathers 1000 Russian system integrators, corporate end-users, distributors and local authorities to meet with Russian and global security, IT and telecom vendors and suppliers at the Second Annual ALL-OVER-IP Forum on 19 November, 2009 in Sokolniki Expo in Moscow, Russia. thePlatform has been selected to manage and publish online video for the Big Ten Network. Specifically, thePlatform will provide centralized back-end management support for two major video initiatives, one aimed at serving international audiences outside the U.S. and Canada, and the other serving domestic sports fans. Akamai Technologies announces the Akamai HD Network, its next generation video delivery offering and the first platform to deliver HD video online to viewers using Adobe Flash technology, Microsoft Silverlight, and to the iPhone, at broadcast-level audience scale. The Akamai HD Network is the only solution that supports live and on-demand HD streaming with a highly-personalized and interactive online experience that matches and complements HD television. YouTube and Warner Music Group announce an agreement to distribute on YouTube the library of music videos from WMG's world-renowned roster of artists as well as behind-the-scenes footage, artist interviews, original programming and other special content. In a first-of-its-kind arrangement, YouTube users will be able to incorporate music from WMG's recorded music catalog into the videos they create and upload onto YouTube. The IMS Research study IPTV: A Global Market Analysis reveals that IPTV deployments globally are largely attributed to tier 1 telcos. By the end of 2014, IMS Research forecasts 40.1 million TV households will be subscribers of tier 1 telco IPTV services. comScore releases August 2009 data from the comScore Video Metrix service, showing that 161 million U.S. Internet users watched online video during the month, the largest audience ever recorded. Online video reached another all-time high in August with more than 25 billion videos viewed during the month, with Google Sites accounting for more than 10 billion. Heavy Reading announces new consumer video research to be unveiled at TelcoTV 2009. Senior Analyst Aditya Kishore will reveal the results of the new study, "Making TV Pay: The Telco Challenge," at the Orange County Convention Center in Orlando, Fla., as part of the TelcoTV Conference and Expo. CCW is the fall's premier conference and exhibition for media and communications technology. CCW features business solutions for content creation, production and post production, media management, distribution and delivery, infrastructure management, and a wide range of communications solutions, including satellite, fiber, hybrid networks, IP Media and more. Hear end-user panels, and meet leading vendors to learn the strategies, tactics and technologies in this rapidly changing market. Be Our Guest! Attend all three CCW events - HD World, SATCON and the IP Media Expo - free of charge! Qualified end-users*, get a free full conference pass and other industry professionals attend the expo, keynotes and sponsored sessions for free! See www.ccwexpo.com/register.asp for complete qualification criteria and to register. We are extending the entry deadline for ideas and concepts by two weeks to the 18th of October 2009. This applies to our professional categories “MPF” and “Freestyle”. Already submitted concepts can also be edited or reworked within this timeframe. AccessKey IP detailed some of the highlights and technical developments of their set top box project. AKYI Vice President of Technology Craig Erickson stated, "We have pioneered solutions and cutting edge technology for tomorrow's demands. The system that we have developed is unique in the IPTV industry and exists nowhere else. AKYI's STB combined with our secure, patent pending USB conditional access key will take IPTV delivery to the next security level and also enable STB type operations on your PC." According to Erickson, "This system combination does not rely solely upon MAC & IP addressing, which can be spoofed (faked). Instead, it uses 1024bit RSA intercommunication and unique key IDs for user verification, supplanting the conventional reliance on MAC+IP address for user ID. It also enables forensic watermarking to be embedded in each user stream, using specific AKYI key IDs for added content security. Our conditional access keys provide a virtual 'lockbox,' over and above any current content distribution system in use today." Espial announces improved performance and power benchmark results for its Espial MediaBase, video-on-demand products, with Intel Solid State Drives and the Intel Xeon processor 5500 series. Espial continues to extend its leadership in commercial-off-the-shelf based video-on-demand solutions. The latest results tested with next generation Intel processor and SSD technologies are captured in a new whitepaper written in collaboration with Intel. The whitepaper concludes the use of Intel Xeon Processors and Intel Solid State Drives dramatically reduces power consumption and equipment footprint for VOD applications. Espial has continued a long-standing relationship with Intel that includes close collaboration on Intel product design, testing and commercialization. This cooperation allows Espial to maintain a laser focus on optimizing its video-on-demand software while leveraging the innovation cycle of Intel and commercial-off-the-shelf servers and storage. Espial MediaBase is a carrier grade, high performance video-on-demand solution that incorporates patented high performance IO and networking technologies, optimized for COTS hardware -- ensuring power and cost effective products for its customers. Tele2 Netherlands has selected Amino Communications as the supplier of MPEG-4 STBs for the provision of IPTV services. Under the terms of the agreement, Amino is expected to supply Tele2 with STBs, including its latest A132 and A532 MPEG-4 dual SD/HD compatible and PVR models - over an 18-month period.